The Diagnodent is a light emitting device that when shined on teeth gives a digital readout that the manufacturer claims will help a dentist detect decay below the surface of enamel. It works by shining a certain wavelength light on the tooth that causes decayed matter to exhibit fluorescence. 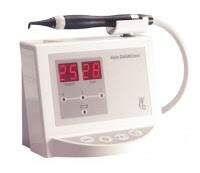 The Diagnodent website states that "The DIAGNOdent operates at a wavelength of 655 nm. At this specific wavelength, clean healthy tooth structure exhibits little or no fluorescence, resulting in very low scale readings on the display. However, carious tooth structure will exhibit fluorescence, proportionate to the degree of caries, resulting in elevated scale readings on the display of the DIAGNOdent. "